Kick your Starfinder experience into hyperdrive when you add Starfinder Accessories to your game! Enhance the visual battlefield with detailed pawns and keep the game moving quickly with rules reference cards. The expansive universe of Starfinder works even better with these useful tools. Paizo releases Starfinder accessories on a roughly bi-monthly basis. With your ongoing Starfinder Accessories Subscription, we'll send each new installment to your door and charge your payment method automatically as we ship each product. You only need to sign up once, and never need to worry about renewal notices or missed products. A FREE PDF copy of each product as it becomes available (when applicable). Each release in your Starfinder Accessories subscription will be automatically bundled with any other Paizo subscription items you're subscribed to releasing in the same month. 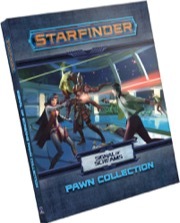 As a bonus, when you sign up to four physical Starfinder subscriptions you'll qualify as a Starfinder Superscriber and gain access to Paizo Advantage, a discount program that grants you a 15% discount on most products available on paizo.com. More details about Paizo Advantage can be found here. Additionally, Starfinder Superscribers receive free PDF copies of Starfinder Society Roleplaying Guild scenarios. WARNING.. to those of you who don't know this is just the pawns. There are no bases to stand them up in this set. Starfinder Accessories Ongoing Subscriptions are now available! This has the option to "start subscription with this [individual] product" as usual, but since all four of these have the same release date, would we have to get all of them at once? I'm interested in the pawn set, but probably can't afford to get everything else simultaneously. Yeah, I'm also rather curious about how multiple products on the same month are going to work. In my case, however, I'd like to pick up the whole set at GenCon. Is that something that's even possible? I think it's just a pick one to start, grab others with Preorder like normal or after the fact. That is my plan at least. Subbed for the combat pad, grabbing the pawns and GM Screen. Based on how it shows up as what it adds to the sidecart, I think you pick one of the four and then can preorder the rest if you want them or not (in other words, you don't automatically get all 4 if you start with just one). Based on this post, it looks like it's left-to-right, so starting with the GM screen gives you all 4, starting with the combat pad gives you that and the pawn collection. Just to clarify here, the first four items in the Starfinder Accessories line will all ship at the same time in August. 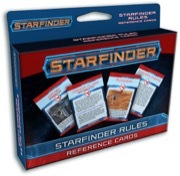 If you want to subscribe to the Starfinder Accessories but do not want one of the starting four items, you will need to sign up with September's release of the Starfinder Condition Cards when that becomes available to start with. This is the very beginning of a subscription and there are certain benefits established that are based in starting with all four items in this subscription line (access to the Paizo Advantage for Starfinder Superscribes and Charter Subscription tags). We will be adjusting the subscription page to hopefully make this more clear. If you need to cancel your Starfinder Accessories subscription to avoid one of these items shipping, let customer service know as soon as possible. If you want to retain a preorder for one or more of the items just let customer service know. Keep in mind, they will not be subscription items and will not receive the PDF benefits. I'm hoping to pick up the four Starfinder subscriptions in order to net the Paizo Advantage and free Starfinder Society sub. However, the accessory sub doesn't seem to be working properly for me. When I attempt to start with the "available now" items an accessory sub is placed in my cart, but the cost of the item isn't displayed and the total price remains unchanged. Anyone else having this issue? Could it be because the GM Screen is no longer available? From what I understand I can't start with the condition card preorder if I want the Paizo Advantage and Starfinder Superscribe benefits or else I would just go with that. We've sold out of the GM Screen on paizo.com, so you will need to start the accessories subscripton with the condition cards. The website should hopefully reflect this in the next 24 hours. I think you can still get Paizo Advantage starting next month if you start all four of the required subscriptions with the September or later items -- you just won't get the "Charter" status after a certain point. For the SFS PDFs, you would miss out on the free PDFs for this month but get free copies of everything from September on. Awesome, thanks for the speedy reply. Just to be sure though, since the GM screen is no longer available does this prevent me from receiving the Paizo Advantage/Starfinder Superscribe benefits? Or am I misinterpreting how choosing which product to start with will affect me? Sorry for the paranoia and thanks again for the assistance lol. Well that is unfortunate. Thanks for the info though. Seeing Starfinder is new and I want to pick up all four subscription services, how do I go about getting everything previously sent out added into my subscription to get the subscription caught up? Beyond a certain point, you can't add past items to your subscription. You usually have at most a choice of two items to start your subscription with (generally the previous and next releases). Earlier items have to be ordered individually. But you may be in luck with the Starfinder subscriptions since the previous releases were all in August, the first month of all Starfinder subscriptions. Since a lot of these items sold out, many of them are not currently available to start your subscription with. But since the September order spawning hasn't started yet (in fact, it hasn't even been announced officially), you may be able to start your subscriptions with whatever is currently available and then start a thread in the Customer Service thread (or send a direct e-mail to customer.service@paizo.com, if you prefer) and ask them if they can add the August items to your subscription to ship whenever they have copies available to ship to you. Any chance we might be able to get an idea of the monthly expenditure a superscriber should expect? It would be easier for me to convince the Budget Officer that we should work in $50/month for awesome Starfinder stuff than saying, "Let's sign up for this awesome subscription thing that I have no way of telling how much it will run us from month to month." Could the line developers look at the expected retail prices for the upcoming year's releases and average them out? Just a thought. The AP and Map lines are planned as bimonthly, and the schedule through next year (which is still subject to change) has them in offsetting months, so that's the underlying rhythm here. Meanwhile, current plans for the RPG and Accessory lines have just a few releases in each line spread throughout the year. This combined with the fact that they are of varying price points means that there's no way to even out the monthly price—most months, there will be just an AP or just a map, but some months, there will also be a hardcover book, a pawn set, a card deck, etc. You can always look at what the next couple shipments have in store on our product schedule page.